From this navigation page, the following information is immediately available about the courses offered by the Biological Sciences Department of Sierra College. Course Selection Guide - Which course should I enroll in? Course Scheduling Pattern - Predicting the future? Specific class information and resources for currently enrolled students is available under the navigation heading "Course Materials". If you need further information or have specific, unanswered questions, feel free to contact department staff. 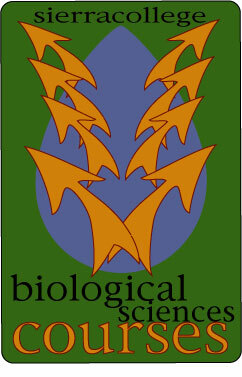 Copyright 2002 Sierra College Biological Sciences Department.